With over 15 years of experience in Hong Kong's printing industry, Richart Printing Production Company specialized in all kinds of printing jobs, providing our clients with a wild range of printing services. This high quality printing services, giving our clients the comfort of one-stop printing services for all the printing needs. Richart Printing also acts as a quality controller to inspect the quality at your standard. Our aim is to make your printing job as easy as possible and take on all the problems before turning over the finished job to you. Client's satisfaction is always our goal of satisfaction Richart Printing can handle jobs that require design, photo re-touching, film output, scanning, colour proofing and hand assembling work or the latest technology (computer-to-plate). We produce newsletters, greeting cards, calendars, manuals, labels, leaflets, paper bags, stationeries, hang tags, packaging boxes and marketing promotional items. And recently, due to the marketing needs, we also provides Digital printing and Inkjet Print of Easy Roll stand banner, banners and posters. While we provide full services from design to print production and delivery, we also manage printing projects for international clients, especially those clients who requires delivery within China and Asia. We will manage delivery for show and conference materials as well as packaging item. 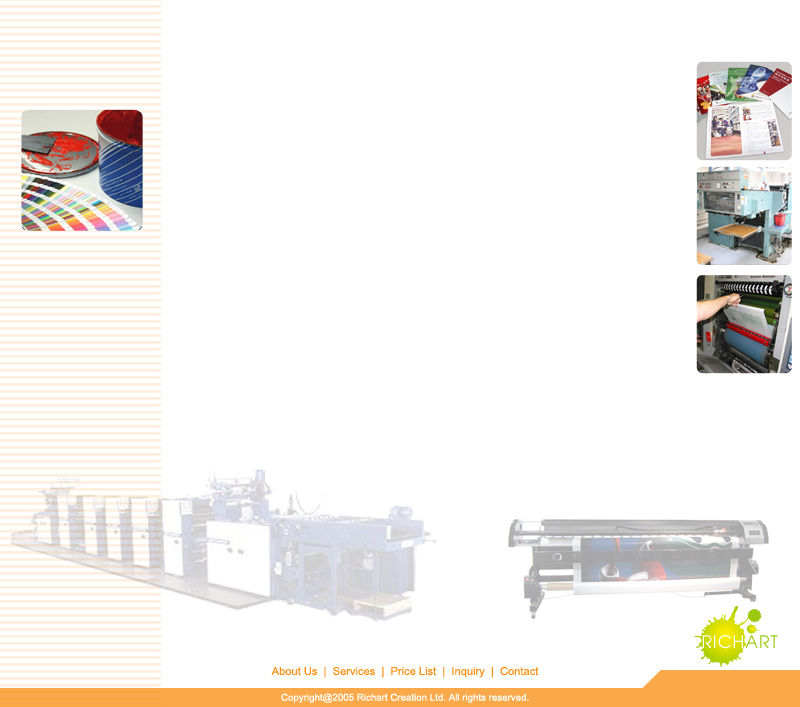 Richart Printing Production Company is the ideal choice for all your printing needs.